Patient comfort is one thing that Dr. Mancuso and her team are known for beyond their skill in the art and science of dentistry. Dr. Mancuso and her team understand the importance of making your visit as comfortable as possible. 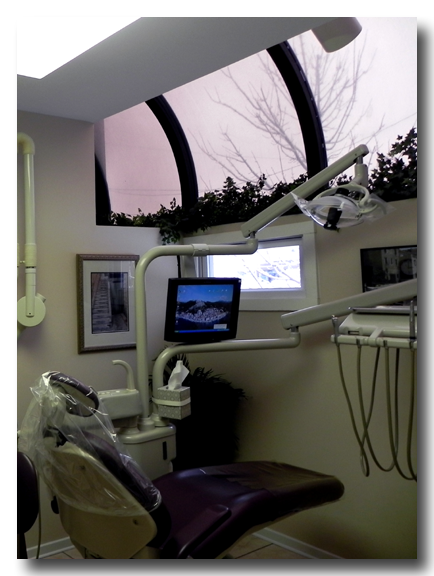 Our uniquely designed single-story Fair Lawn office is barrier-free, and was designed and built for dentistry with convenient parking and no stairs. Our team is friendly and courteous. They take pride in knowing who you are. Our patients are not a number and there is never a need to sign in. Your time is valued. We do our best to ensure you are seated promptly for your examination, consultation or treatment – as you should be. Our circular waiting room, offers wifi access, FIOS television, filtered Poland Spring water, and features the artwork of Dr. Mancuso. Once your seated for treatment you will notice the sky-views in each operatory. From there you be invited to relax with your own chair-side entertainment center, with individually-covered headphones. Choose from the latest movies (including children’s), music DVD’s, sports, TV sitcoms, or feel free to bring your own. Many people find this helpful in alleviating the anxiety and stress normally related to dental visits. We are totally committed to your comfort as well as your care.